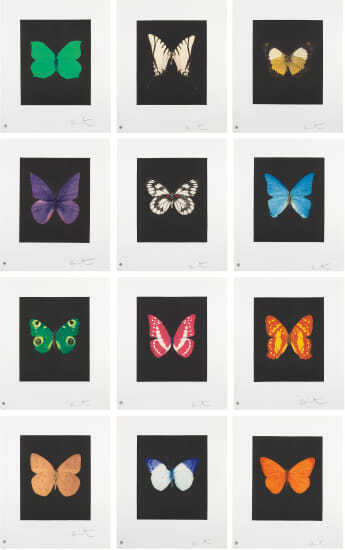 There is no other contemporary artist as maverick to the art market as Damien Hirst. Foremost among the Young British Artists (YBAs), a group of provocative artists who graduated from Goldsmiths, University of London in the late 1980s, Hirst ascended to stardom by making objects that shocked and appalled, and that possessed conceptual depth in both profound and prankish ways. Regarded as Britain's most notorious living artist, Hirst has studded human skulls in diamonds and submerged sharks, sheep and other dead animals in custom vitrines of formaldehyde. In tandem with Cheyenne Westphal, now Chairman of Phillips, Hirst controversially staged an entire exhibition directly for auction with 2008's "Beautiful Inside My Head Forever," which collectively totalled £111 million ($198 million). Hirst remains genre-defying and creates everything from sculpture, prints, works on paper and paintings to installation and objects. Another of his most celebrated series, the 'Pill Cabinets' present rows of intricate pills, cast individually in metal, plaster and resin, in sterilized glass and steel containers; Phillips New York showed the largest of these pieces ever exhibited in the United States, The Void, 2000, in May 2017. The complete set of 12 etching and aquatints in colors, on wove paper, with full margins, the sheets loose (as issued) contained in the original black fabric-covered portfolio with embossed titles. All signed and numbered 45/45 in pencil, published by Other Criteria, London (with their inkstamp).